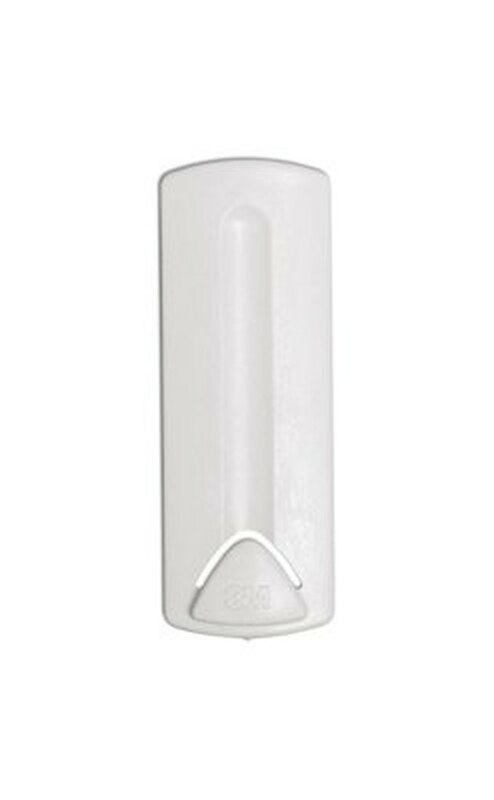 Plate hangers offer a secure way to hold plates on a wall. 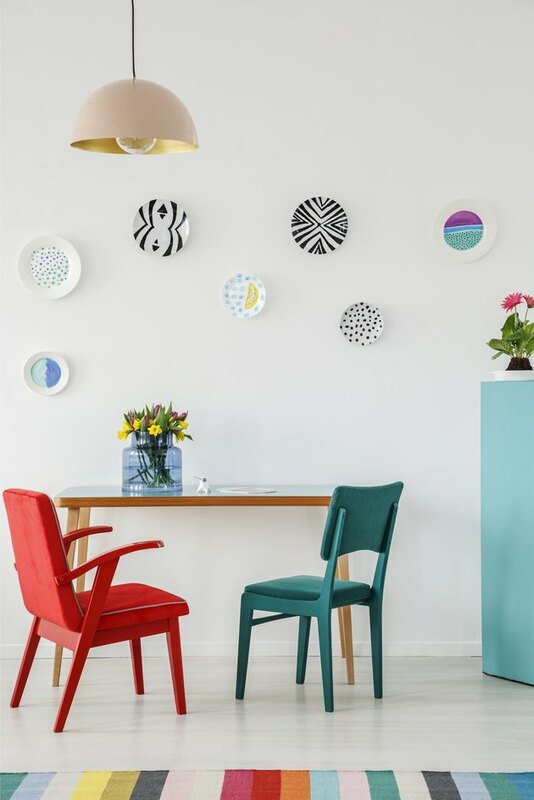 Hanging plates on a wall is much like hanging artwork or framed photos, in that it's crucial to choose hardware capable of holding each plate. In most cases, nails are required to hold hooks on the wall, which in turn hold the hangers attached to each plate. Old-fashioned adjustable wire plate hangers are reusable and ideal for swapping out your plate display from time to time, while adhesive plate hangers offer a way to hang plates in a way that protects their edges from scratching. Removable adhesive hooks allow you to hang plates on a wall without nails. The classic wire-and-spring plate hanger offers a simple way to hang a decorative plate on the wall. These hangers feature pairs of hooks at the top and bottom, designed to grab the plate securely from behind. Springs attached to the wire hook assemblages stretch when pulled to secure the hooks around the rim of the plate. This style of hanger comes in a variety of sizes and weight ratings, so choose one that fits the plate and is strong enough to hold it securely. Also, select a version that has coated wire on and near the hook area to prevent scratching the plate. Once you've secured the hanger to the plate, hang the plate by hooking the bent wire at the top of the hanger over a picture hook already attached to the wall. When measuring a plate to choose the best adjustable hanger, measure it on the back from top to bottom across its center, from rim to rim. Make sure the plate is positioned as you wish to hang it on the wall, depending on its design and shape. This method will accommodate the added distance required to span raised ridges on the bottom, and will ensure that the hanger will fit even a non-circular plate shape, such as an oval. A picture hanger can be used with adjustable plate hangers. A picture hook is the most common way to attach a plate to a wall, no matter which hanger type is used. Picture hooks, typically metal, feature a hook on the bottom and a hole for a nail at the top. The hooks are sold with appropriate nails, so there's no need to buy nails separately. Purchase a hook rated strong enough to hold the plate; this way the hook won't bend or fail during use. Choose a location to hang the plate, remembering that the hook itself will be hidden somewhere behind the upper half of the plate, depending upon the hanger used. Push the nail through the holes in the hanger, then pound the nail securely into the wall. The nails are normally driven at a slight downward angle. If you prefer to use plate hangers that aren't visible when in use, you can opt for stick-on disc hangers. These discs are shaped a bit like flat Christmas ornaments with a hanging loop of wire on top. The back of the disc features a water-activated adhesive designed to stick to most ceramic and porcelain plates. It also sticks to unfinished wood and the backs of some mirrors. Make sure the back of the plate is clean, dry and smooth, otherwise the adhesive may fail. Position the hanger in its ideal location on the plate back—typically just below the rim near the top of the plate, if viewing the plate as it will hang on the wall. Moisten the adhesive on the back of the hanger, then press it onto the plate in the chosen location. Hang the plate from a picture hanger. As with other hanging methods, be sure the disc hanger and the picture hanger can support the weight of the plate. If hanging a platter or heavy plate, use two disc hangers with a piece of picture wire tied between their loops. Hang the wire from a heavy-duty picture hanger. 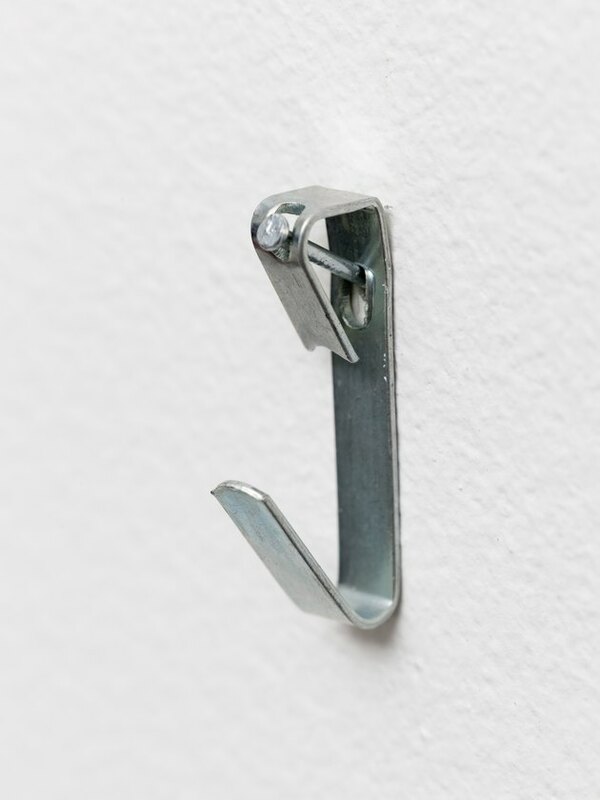 Command Brand adhesive hooks offer an alternative to nails. Removable adhesive strips and hooks, such as those in the Command product line from 3M, offer a way to hang plates on a wall without creating nail holes. This method is ideal for small plates or for temporary projects, such as hanging a holiday plate collection for Christmas. Choose a product best suited to your plate—for instance, if you plan to use an adjustable wire plate hanger with the removable wall device, choose Command's wire-backed picture hanging hook. As with nail-based hanging methods, removable strips and hooks are rated according to how much weight they'll hold. Choose a product designed to hold more than the weight of your plate. Follow the directions on the Command packaging, as this varies from product to product. Make sure the wall surface is completely clean and smooth before pressing the adhesive hook or strip in place.